BEVERLEA WALZ PHOTO | Last summer the Shelter Island Library sponsored the “Under the Tent” program to the delight of children and adults. Given the natural resources on Shelter Island conducive to swimming, sailing and fishing, there’s hardly a lack of activities for kids to have a carefree summer. But there are also a number of organized activities targeted for different age groups that can complement those lazy days on the beach. The Shelter Island Public Library will hold events for children and teens throughout the summer “almost daily,” according to Jennifer Blume, youth and reference librarian. On June 15, children can make Father’s Day crafts at 2 p.m., and on June 28, the movie “Escape From Planet Earth” will be screened at 2 p.m. 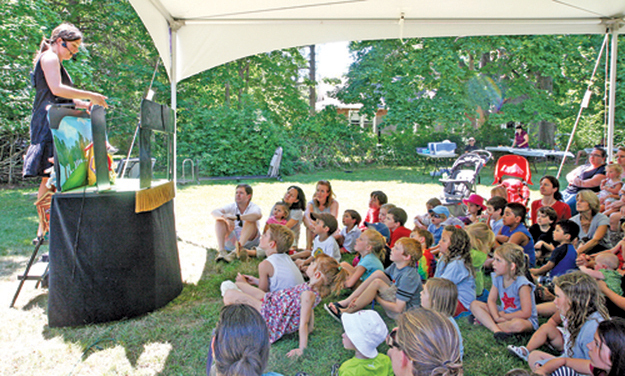 The library will also hold events featuring comedic jugglers “The Gizmo Guys” on July 6 and “The Goat on a Boat Puppet Theatre” of Sag Harbor on July 8. There will also be many other events for children, from art and yoga classes to story time and magicians, so stay posted for dates and details. Saturday, June 1, the library kicks off its annual “Battle of the Books” for kids entering grades 6 through 9 where teams throughout Suffolk County read the same eight titles, culminating in a competition at Stony Brook University August 10. Additionally, on Wedensday, June 19 at noon the library will host a class, “Getting Ready to Babysit” for students grades 6 through 8. There’s also a summer reading club, where children and teens can read books they choose, report on them and compete for prizes. This year’s children’s reading club theme is “Dig Into Reading” and the theme for teens is “Beneath the Surface.” All events for children and teens are free, but registration may be required for some. For more information, call 749-0042 or visit the library’s website at shelterislandpubliclibrary.org/. The town’s recreational program for youths includes arts and crafts, tennis and nature programs, as well as literacy and math classes. The FIT Center will also sponsor a number of adult activities, including body sculpting, Zumba and Tai Chi. Mandatory registration for all programs and classes is June 29 at St. Gabriel’s Retreat between 9 a.m. and noon with activities beginning on Monday, July 1 and ending July 26, except for tennis continuing until August 24. Arts and crafts will be offered at St. Gabriel’s on Mondays and Fridays with kindergarten and first grade from 8 to 8:45 a.m.; grades three and four from 9 to 9:45 a.m.; grades 5 and six from 10 to 10:45 a.m.; and grade two from 11 to 11:45 a.m. The fee is $60 per student. Youth tennis with Moussa Drame takes place at St. Gabe’s on Tuesdays and Thursdays as follows: grades five and six from 8 to 8:45 a.m.; grades three and four, from 9 to 9:45 a.m.; kindergarten through grade two from 10 to 10:45 a.m.; and grades three and four RB from 11 to 11:45 a.m.; The fee is $140 per student. Tennis clinics take place at the FIT courts on Tuesdays and Thursdays for seventh through 10 graders from 6 to 7 p.m. and 16 and older from 7 to 8 p.m.. The fee is $180 per student for 14 sessions. The summer nature program operates on Tuesdays and Thursdays at St. Gabe’s as follows: grades three and four, from 8 to 8:45 a.m.; kindergarten and grade one from 9 to 9:45 a.m.; grades five and six from 10 to 10:45 a.m.; and grades one and 2 from 11 to 11:45 a.m. The fee is $60 per student. For more information on the youth or adult programs, call Garth Griffin after 4 p.m. at 749-0978 or for the literacy or math programs, Ginny Gibbs at 749-0302, extension 203. While the Mashomack Preserve is a year-round operation, the staff kicks into gear big time during the summer season, offering a wide array of programs for youths and families. The Young Naturalists activities are designed to give hands-on experiences to youths ages 4 and up. New this summer are story walks for families. Kids walk a short distance, then read a page from a seasonally appropriate nature-themed book. Books are posted along a half-mile portion of a trail for one month at a time. Family fun programs at Mashomack offer activities throughout the year and children as young as infants can attend with their parents. Twice annual haul seines are a favorite with families, and catching fireflies is a self-directed activity during the summer. The summer Children’s Environmental Education Program has taught nature appreciation and conservation ethics to children between the ages of 8 and 12 since 1989. These week-long sessions run in July and August, reaching 90 children through activities such as hiking, muddling in a marsh, a canoe and kayak trip and nature art. Many of these enthusiastic participants choose to become youth assistants for the program once they are 13 or older, adding an additional 20 teens involved each summer. Registration for the summer Children’s Environmental Education Program begins on Monday, June 3, at 9 a.m. and you can register in person or by telephone. But the staff warns that the program fills fast, so if your child wants to participate, it’s wise to register early. Another special program is an after-school nature program for children 4 and older Wednesday, June 12, from 3 to 4:30 p.m. The group will learn the difference between worms and caterpillars and read the Bob and Otto story together. Throughout the summer, there will be special activities, so check back with listings that will be carried in the Reporter as well as at nature.org/Mashomack. Reservations are necessary for all programs except Visitor Center explorations and story walks. Call Mashomack at 749-1001. At Sylvester Manor, registration is open for youth programs. “The Imaginarium” is for 3 and 4 year olds and runs Monday through Friday from 9 to 11 a.m. in July and August. Children will explore the grounds and plant seedlings while learning about the farm and playing farm-themed games. Registration is required at least 24 hours in advance and the cost is $40 per day. The Young Farmers Program for 5 to 10 year olds begins in July and runs Monday through Thursday from 9 a.m. to noon and Friday from 9 a.m. to 1 p.m. This program introduces children to farm tasks, such as planting, weeding and harvesting and teaches children how food moves from the farm to their plates. The Farm Science Program for youths between the ages of 7 and 12 runs select weeks in July and August, Mondays through Thursdays from 9 a.m. to noon and Fridays from 9 a.m. to 1 p.m. This program explores the natural processes of the farm and includes experiments and group projects. Both the Young Farmers Program and the Farm Science Program cost $300 per week and registration must be completed by the Friday before the program week. The Young Farmers Program is completely booked for the summer, but waitlist options are available. Shelter Island Yoga and Fitness will be offering hip hop, tennis, soccer and yoga classes this summer for children between the ages of 3 and 9. The cost is $20 for drop-ins, but with pre-registration, the price drops to $15 per child and there’s a further reduction to $10 for siblings. Parents can drop off their children and participate in their own fitness class for $20 or take advantage of a free gym pass. Hip hop classes start June 1 from 3 to 4 p.m. for children between the ages of 3 and 6. Tennis classes are on Sundays from 11 a.m. to noon for those between the ages of 4 and 9. Kids soccer will begin in July. “Parents Night Out Yoga for Kids” will be held July 16, 23 and 30 and August 6,13 and 20, for children between the ages of 4 and 9. Sessions are from 5:30 to 7:30 p.m. and children can come in their pajamas. The cost is $25 per child and $15 for siblings. For further information, call Julie Bliss at 805-6279. Shelter Island’s Communities That Care focuses most of its attention on programs during the school year, working with youths to help strengthen their resolve to avoid underage drinking and use of illegal drugs. Look for CTC to be running the concession stand for seven of the Shelter Island Bucks Collegiate Baseball League home games this summer. Additional reporting contributed by Tara Smith.